In the 21st century, warring parties no longer care about winning. Instead, conflicts drag on and belligerents only seem interested in prolonging the massacres. We asked Mary Kaldor, professor at the London School of Economics, about how wars can be ended and the global role awaiting the EU. Green European Journal: Your work argues that the post-Cold War era was characterised by the emergence of “new wars”. What is new about these wars? Mary Kaldor: When I published my book New and Old Wars in 1999, lots of critics said that new wars weren’t actually new. And maybe they are not completely new in all their qualities, but that wasn’t the point of my argument – I was drawing attention to the new logic of wars. Wars of the 19th and 20th century were typically contests of wills, as the Prussian military theorist Carl von Clausewitz defined them – deep-seated political contests that couldn’t be solved peacefully. In these wars, each side wants to win. New wars, on the other hand, function according to a different logic. In new wars, numerous armed groups are parties to the conflict and they are more interested in violence itself than in winning or losing. They use violence both to propagate extremist ideologies based on fear and to reach their economic and political goals. These wars are very difficult to end. New wars evolved out of the classic civil wars of the 1960s and 70s, which were largely about rebels fighting authoritarian or colonial regimes and were usually led by Marxist-Leninist intellectuals. These ideological wars ended around the end of the Cold War. Intellectuals shifted from Marxism-Leninism to a belief in democracy and civil society; while simultaneously the nature of the state changed as well. Due to neoliberalism, states began to lose legitimacy and therefore new wars started to manifest themselves as struggles between warlords vying for power. In empirical terms, many of the characteristics of these wars were not new, for example, ethnic cleansing and other atrocities, but globalisation, interconnectedness, mobile phones, and the internet did represent new elements. Did the international community understand this new logic? This is exactly the reason why I wrote this book. The international community looked at the wars of the 1990s in old-war terms. It therefore thought that the only way to intervene – for example in the Balkans – is either by helping one side win or negotiating a peace agreement from the top. The problem with both of those approaches is that in a new war logic they make the war worse: intervening just increases the justification for fighting and top-down peace agreements are not only hard to achieve, but can actually entrench the very same criminal armed extremist groups doing the fighting. In the optimistic 1990s, the international community thought that they could act as deus ex machina, and come in and solve these problems. I wanted to shift this mindset. Interestingly, Russia has understood the logic of new wars: they have a concept of non-linear war, which was publicly announced in 2013 by the Chief of the General Staff Valery Gerasimov. Their idea was that it was really easy to exploit a new war situation and to create instability. That has been their strategy in Ukraine. Is this also true in Syria? Syria is interesting because Russia has played a much more classic role in Syria and intervened on the side of President Bashar al-Assad. Following their intervention, many commentators are saying that Assad has won. But what has he won? He presides over a continuing new war: Syria is now, after eight years of conflict, very different from what Syria was before. Its territory has been covered with armed militias who make money from checkpoints, kidnapping, and taking hostages. What could the West have done differently in Syria? The West made a huge mistake right at the beginning. There was a top-down mistake, mainly due to the approach of the European Union. The EU had a lot to lose in Syria but it reacted to this situation by suddenly dropping all its relations with the country and calling for Assad to step down. Instead, it should have told Assad not to bomb Syrian citizens and to respect human rights. you cannot use classic military means to protect human rights – as these measures (due to their nature) violate those very same rights. The way the Western actors looked at the war was a real problem: they saw it as a conflict between Assad and the protesters, rather than as a human rights situation. This doesn’t mean that there weren’t some good efforts. The agreement that former UN Secretary-General Kofi Annan reached as Syria envoy right at the beginning in 2012 was rather good. United Nations monitors were allowed into the country and the situation stabilised a little bit while they were there. It would have been very important to keep these monitors in the country and to expand them as much as possible. Another thing that hasn’t been noted is the way in which Western countries and particularly the EU and the UK’s Department for International Development supported local administrative councils. It was a rather innovative approach that managed to take the nature of new wars into account. The problem was that it wasn’t backed politically. The peace talks were still based, on the one side, on the government, and, on the other side, on an opposition that was based outside the country and had very little connection with what was happening on the ground. Just a decade ago there was a lot of optimism among international commentators after the member states of the UN endorsed a global commitment called the Responsibility to Protect (R2P), which would have required them to act together against crimes against humanity. What was the problem with it? Responsibility to protect was always a flawed concept. I am totally in favour of the idea that the international community should intervene to stop genocide, massive violations of human rights, and ethnic cleansing, but the problem is the means that they use. Two high-profile cases have shown how flawed this concept is. In Kosovo, there was a humanitarian intervention (prior to endorsing R2P) and about a decade later R2P was applied in Libya. In these cases, the main means were air strikes – even though it is obvious that we cannot protect people on the ground with air strikes, as they kill some of the people that they are supposed to protect. In addition, intervention created huge polarisation in the case of Kosovo. Even though Kosovo Albanians were allowed to return to their homelands, Serbians and Albanians are still unable to overcome its legacy and the cover of bombings saw a big increase in the ethnic cleansing of Kosovo Albanians. Moreover, NATO empowered the KLA (Kosovo Liberation Army, an ethnic-Albanian paramilitary organisation) thereby promoting extremists while side-lining those who had protested peacefully. Later, in the case of Libya, once the intervening force had bombed the country with heavy weapons, they changed the objectives to regime change and empowered those same rebel militias who are still creating instability today. Based on the examples above, the actual practice of the responsibility to protect has been problematic. The argument that needs to be made is that you cannot use classic military means to protect human rights – as these measures (due to their nature) violate those very same rights. We have to think much more about human security – the people’s right to be protected and the means through which this can be done – and that has to be much more about policing and law enforcement than classic military responses. This is also in line with the tasks of a possible European armed force which shouldn’t be an army to defend our borders against Russia in a classic war, but a human security force somewhere between the police and the military. A force that is designed to protect people in cases of conflict, a force that involves both military and civilian personnel and both men and women. What role do new technologies play in war today? New technologies have enormously affected war. The war on terror, for example, uses a new kind of long-distance assassination, drones, which is absolutely terrifying and undermines basic norms. Before 2001 there was a huge reluctance to use drones because targeted assassination is forbidden in international law. It is really alarming that we just saw the Houthis in Yemen using drones in their conflict; the further spread of drone attacks could be a frightening prospect for the future. In a similar way, we are seeing other new technologies in new wars: social media and websites have become hugely important in propagating extremist ideology. Improvised explosive devices are evolving too, I call them vernacular technologies, as they depend on local ingredients such as fertilizers and chemical detergents. These are becoming more sophisticated and deadlier with time and with the use of mobile phones as triggering devices. we are seeing other new technologies in new wars: social media and websites have become hugely important in propagating extremist ideology. This combination of drones, vernacular technologies, and social media is toxic and explains to a great extent the nature of new wars. About 20 years ago, there was a big debate within the US military about the revolution in military affairs, as part of which experts, politicians, and military people wondered how computers would affect war. In this sense, the Afghan War and second Gulf War after 9/11 were seen as the epitomes of a new form of war – a more effective form of confrontational war. At the beginning, US Secretary of Defence Donald Rumsfeld was extremely proud of how quickly the US managed to topple Saddam Hussein and the Taliban due to new technologies, but the war on terror has created new opportunities for terrorists and the US soon became involved in prolonged new wars. Is it possible to make predictions about the wars of the future? What worries me is that today’s extreme version of neoliberalism will continue being a driving force of new wars. We see the economic and political disintegration of states all over the world; and, unless we start to develop alternative policies in our own societies to reduce inequality and allow people to have legitimate livelihoods, we might end up in a really volatile situation. What is happening in the UK after the Brexit referendum, the murder of the mayor in Gdańsk, and many other developments in Europe are very bad signs for the future. If the EU disintegrates, we might see something like a new war across Europe, and the problem that I am reiterating is that new wars are incredibly hard to end. You cannot end them by simple victory, there is no magic bullet; it is a very complex process, which requires a reconstruction of political and economic legitimacy. We therefore have to work very hard to preserve that legitimacy in Europe. How can we tackle the challenges posed by the refugee crisis, taking into consideration both the backlash in European societies and the needs of developing countries? Migration is a characteristic of our times, and we have to think of how to manage it rather than how to stop it. Overall, it shouldn’t be a problem. Even if you take all the people who are coming from Syria, it is still a tiny proportion of the European population. If there had not been so much political noise about them, we would have probably absorbed them relatively painlessly, especially if we had made the effort to make sure that we have the capacity in terms of public services and jobs. More importantly, there needs to be a new relationship with Africa and the Middle East that really enables development in those places, so that people can feel more committed to their own societies. So, we need a dual strategy and the task ahead of us is huge, dealing with climate change and regenerating prosperity – but this really is the alternative to war. Nuclear weapons are still facts of the foreign policy landscape, as we see with Iran and North Korea’s efforts to have their own bombs. What should be done about nuclear weapons? Nuclear weapons are a terrific concern and the only way to deal with them is through disarmament. All the notions of deterrence are imaginary. President George W. Bush argued that Iran is not sane enough for deterrence, and that therefore we have to stop the country from getting nuclear weapons. But if you have to be sane for deterrence to work, then what’s the point of it to begin with? Because I would say that no sane person would ever allow a nuclear weapon to be used. the task ahead of us is huge, dealing with climate change and regenerating prosperity – but this really is the alternative to war. Nuclear weapons are the extreme symbols of national sovereignty in that they signal that you are prepared to kill everybody to preserve it. When the question of the legality of the use of nuclear weapons was brought before the International Court of Justice, it ruled that nuclear weapons could be used in the case of a very extreme threat to the existence of a state. But what does that mean? No one really understands because these days states are so interconnected. If we look at the worldwide trends, we are moving beyond national sovereignty and are moving inevitably towards an interconnected and globalised world. The question is either the nation disintegrates into Syria-type situations or we try to get together and bring about effective systems of transnational governance – something along the lines that we see in the EU now. If we manage to improve our governance, it will become much easier to reach agreements on nuclear weapons. What direction should the EU’s foreign and security policy take in the future? I am very supportive of the global strategy that was formulated by EU foreign policy chief Federica Mogherini in 2016. Her policy on how to address wars is very much in line with my concept of human security. It emphasises the need to have multi-level talks, to be local as well as national, the need to reconstruct legitimate political authorities, the need to protect people on the ground, and to work on an alternative economic approach that creates livelihoods for the people. Where the EU could do more is in the area of justice. These new wars built on a mixture of war and crime demand a functioning justice system. Mary Kaldor (1999). 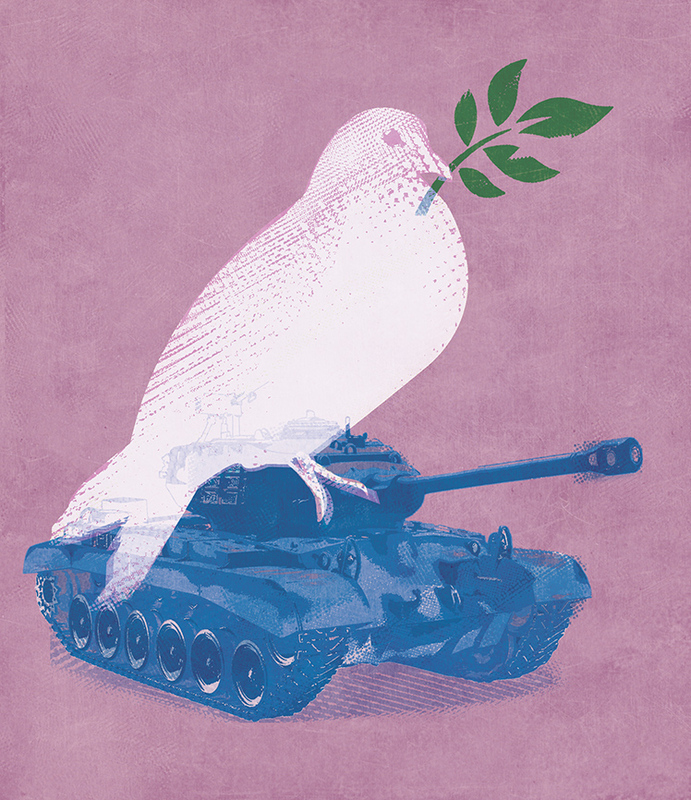 New and old wars: organized violence in a global era. Polity Press. In an article published in the Voenno-promyshlennyi kur’er, the Military-Industrial Courier, Gerasimov wrote: “In the 21st century we have seen a tendency toward blurring the lines between the states of war and peace. Wars are no longer declared and, having begun, proceed according to an unfamiliar template.” He added: a ‘perfectly thriving state can, in a matter of months and even days, be transformed into an arena of fierce armed conflict, become a victim of foreign intervention, and sink into a web of chaos, humanitarian catastrophe, and civil war.” (See Mark Galeotti’s “The mythical ‘Gerasimov Doctrine’ and the language of threat”).